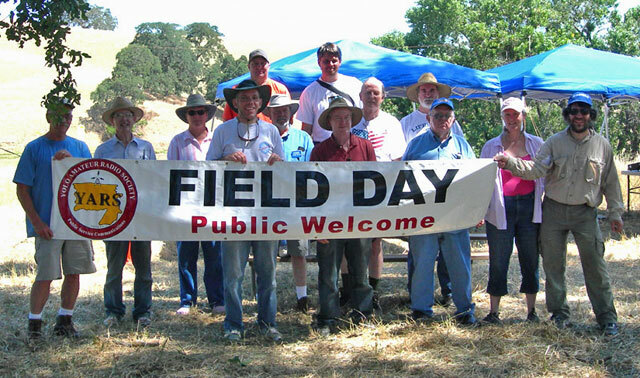 Yolo ARES and the Yolo Amateur Radio Society joined together for this year's Field Day. The event was held at the Timm Ranch, located north of Allendale in the Vacaville foothills between Vacaville and Winters. Twenty nine individuals participated in the event. Twenty four were licensed amateur radio operators, and five were children or unlicensed visitors. The event was publicized in the the Davis Enterprise and the Woodland Daily Democrat. 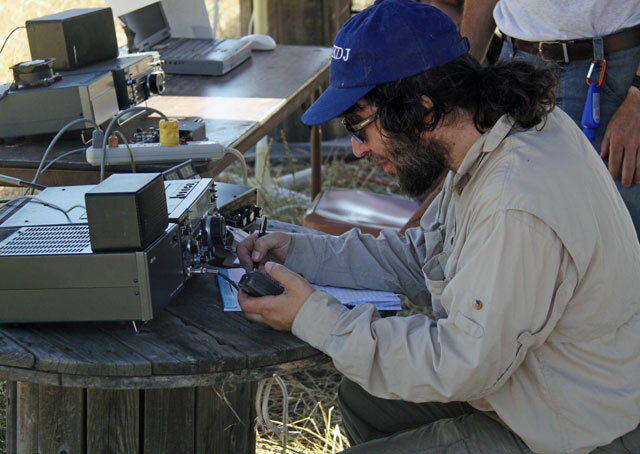 Three amateur radio operators that were not members of the sponsoring clubs saw the articles and participated with us. The club call sign, W6YAR, was used to operate three stations which were powered by two electric generators. 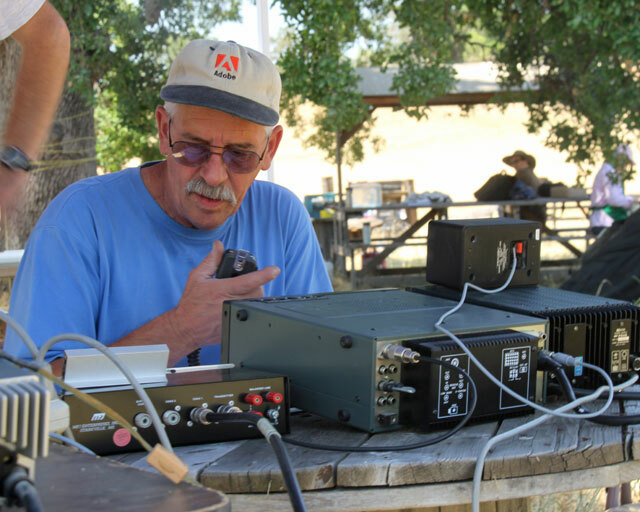 Operators made contacts via SSB, CW, and some of the other digital modes. All operations were conducted in the HF bands. Field Day set up started at 8:00 a.m. on Saturday. Thorough site planning and logistics pre-planning allowed thirteen operators quickly set up the antennas, tents, and stations. The site was cleared at 12:30 p.m. on Sunday. Credit for the smooth operations of the event goes to: Dave Simmons, W6OT (Antennas), Bill Ragsdale, K6KN (Site Selection and Digital Station), Robert Brunk, N6KIX (CW and SSB Stations), Donald Matteson, KI6PEL, (Food Preparation), and Gary Matteson, WA6TQJ (Planning and Coordination). From left to right: front row - Greg Kruckewitt, KG6SJT; Gary Matteson, WA6TQJ; Ken March, KF6AGM; Dave Simmons, W6OT; Ben Norman, WA6NIK; Alison Kent, KI6IMU; Allan Hollander, KG6KDJ; second row - Marion Miller, K6MZ; Peter Miller, KQ6ZL, Bill Ragsdale, K6KN; Rob Brunk, N6KIX; back row - Donald Matteson, KI6PEL, Wes Hardaker, W6SK. 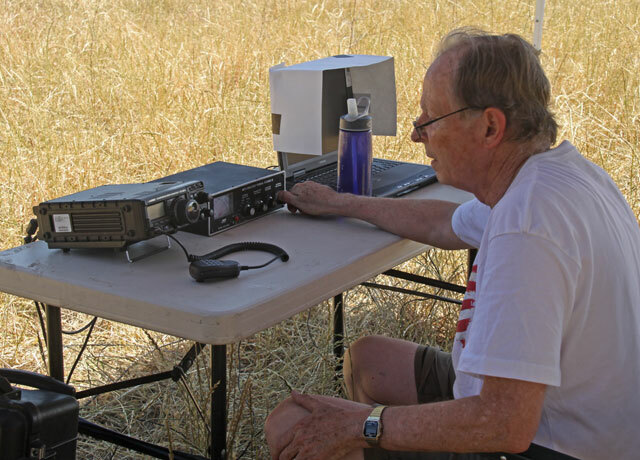 Bill K6KN at one of the operating stations. Allan KG6KDJ at one of the operating stations. Greg KG6SJT at one of the operating stations. 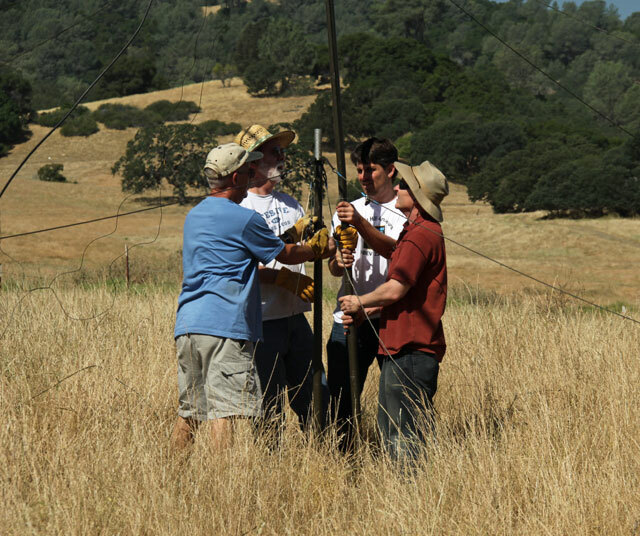 Raising the mast for the beam antenna.